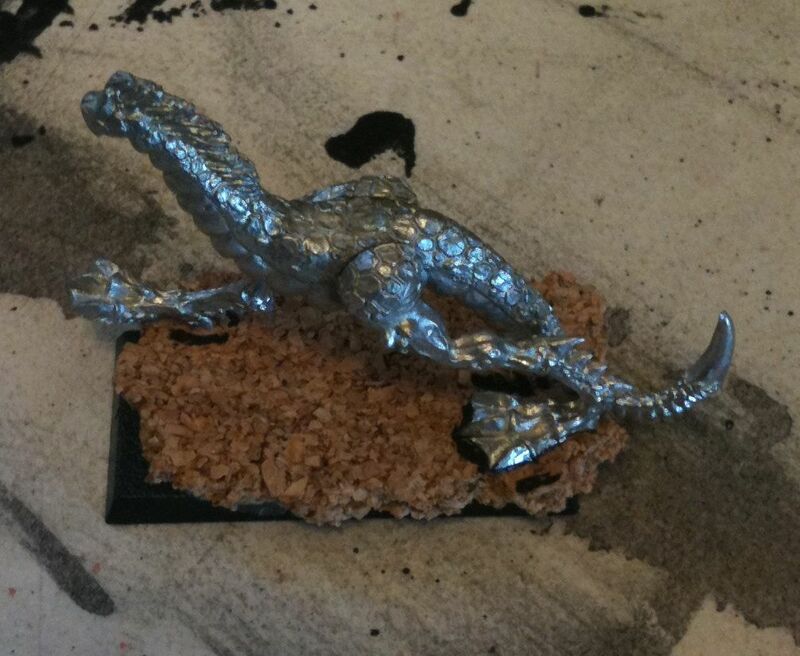 Welcome back intrepid readers to another post on working with miniatures completely devoid of stylish purple text. 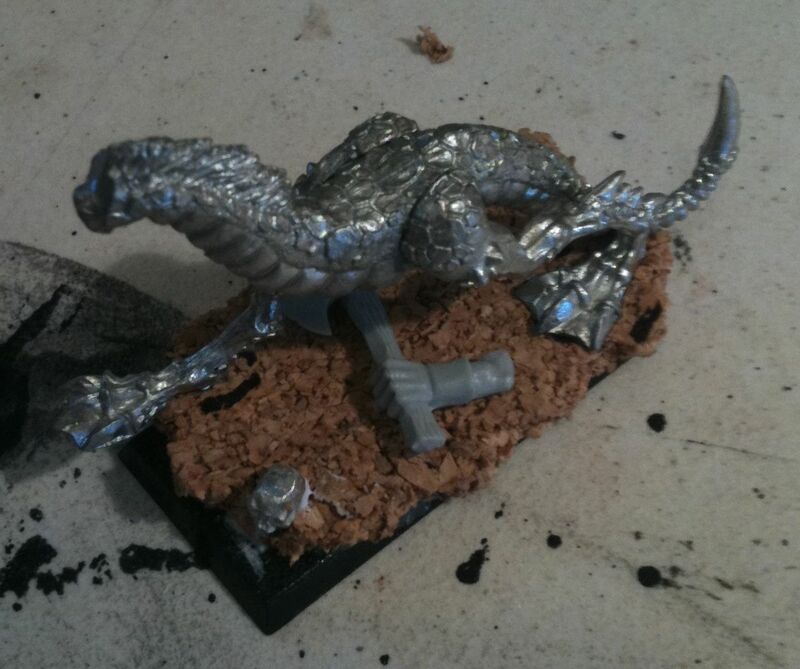 After letting the glue dry on the multi-part OOP Daemon models and more importantly between the cork tile and the plastic GW cavalry base, it was time to finish off the base and securely mount the model. The first thing I did was test fit the model and I got out a sharpie and traced roughly where the feet would go. Then I looked in my toolbox for two part resin epoxy. Finding none I decided rather than bike to Canadian Tire I would just use super glue to pin the model to the base. 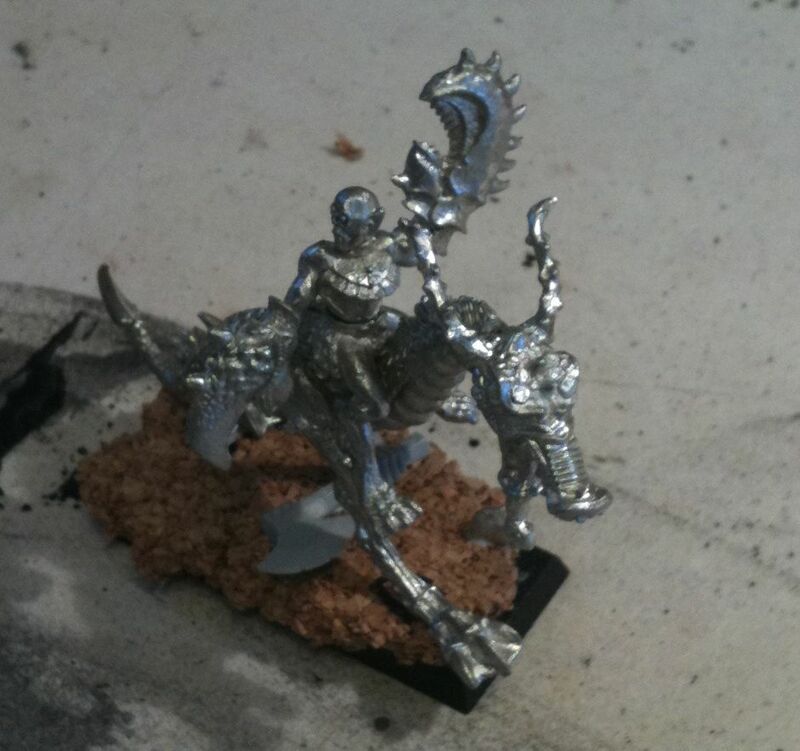 Perhaps if the model was plastic this wouldn’t be necessary, but as this model was multi-part metal and was to serve as a Herald of Slaneesh in a Chaos Daemon Warhammer army, pinning the model to the base would be the wisest course of action. 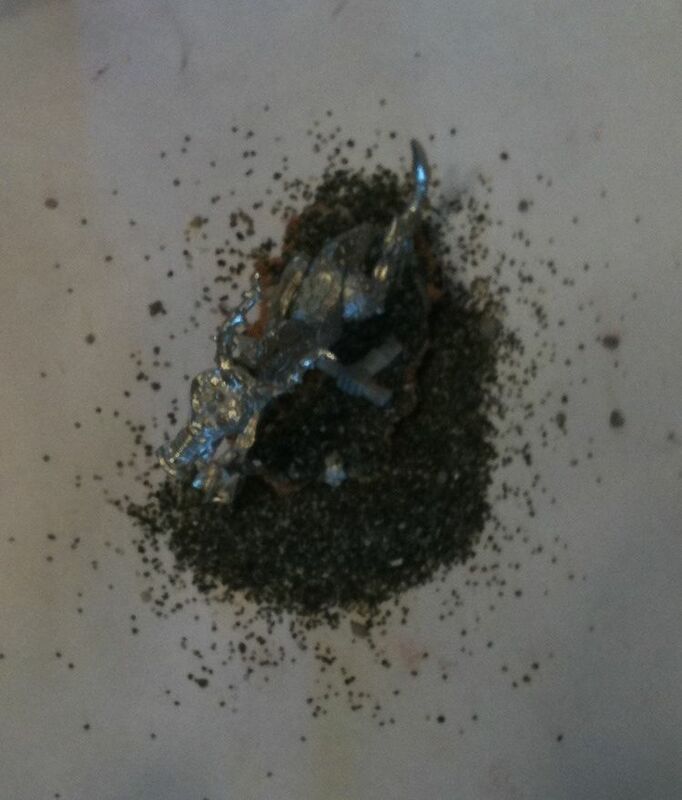 I got out a piece of metal rod that I got in a whole bag from a hobby or craft store. I got about dozen two feet long pieces in 1994 and I think I’m on the second one. I estimated how long of a piece I need then got out heavier-dutier snips and voila a short ‘pin’. 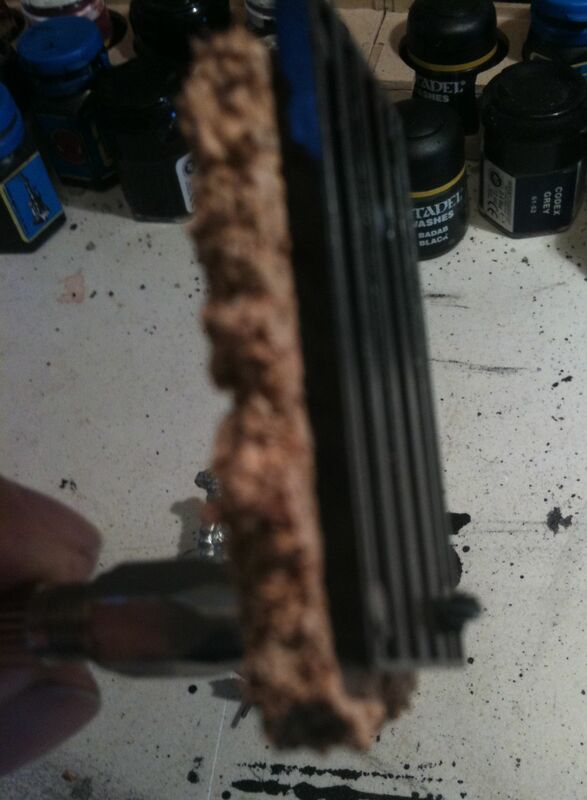 I made sure it was long enough to go through the cork and the plastic by comparing it to the thickness of the base. 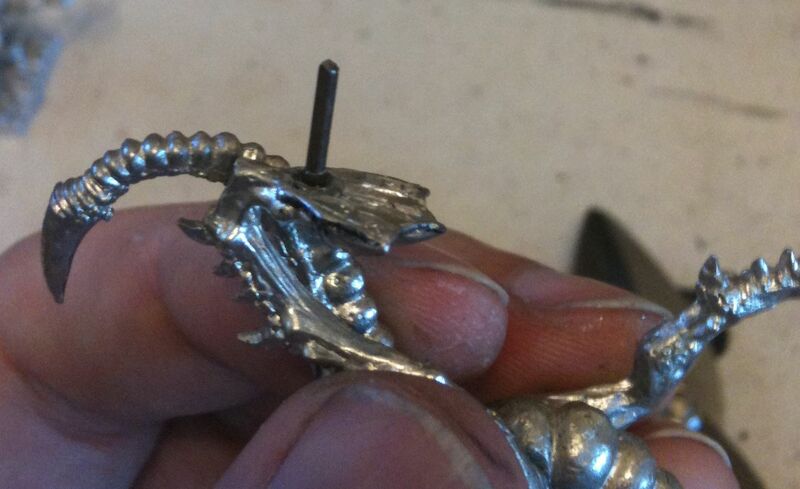 Next I used the pin vise to carefully drill into the rear foot of the Slaneesh Daemon. I didn’t want to drill through the foot, which wasn’t exactly thick. After a few minutes of patient twisting I had a hole of sufficient size. 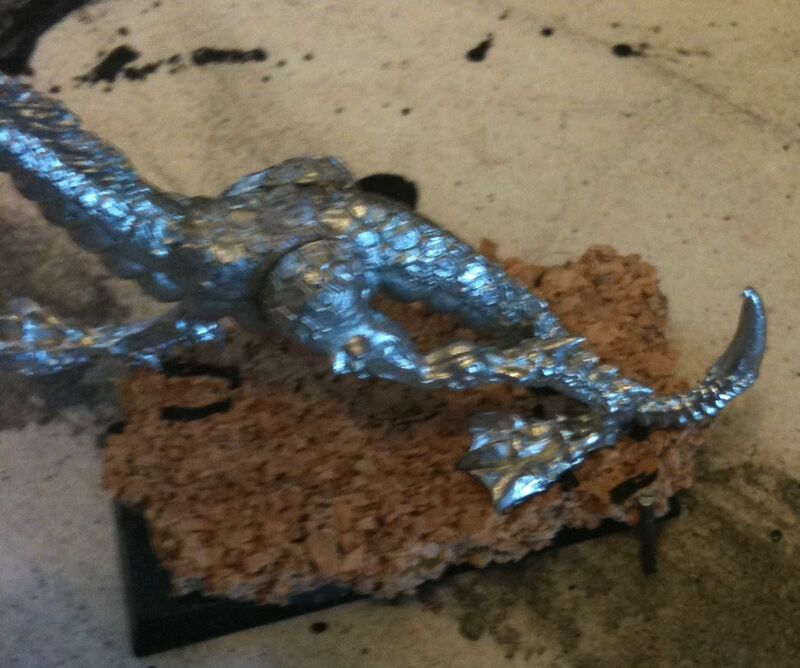 I then used super glue to fix the metal pin to the model. Then I place the model over the cork base and figured out approximately where I’d need to drill a hole in it. Go slow with your drilling and this time you do want to go all the way through. Using a judicious amount of super glue on the pin and both feet of the model I fixed the model firmly to the cork flooring material. Then it was time for some more test fitting, I even decided the model deserved a head. 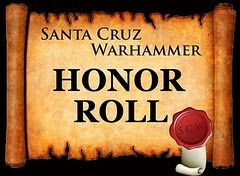 It also deserved ‘scenic scatter’ basically little bits and bobs to make the base unique. I tried one of the big resin skulls, but in the end didn’t like it and went with a piece of an old 2nd Edition 40K box set Goff and another 28mm Black Cat Bases skull. After they were secured to the model using Weldbond, it was time to thin some white glue and put it strategically on the base to secure beach sand. This needs drying time, several hours, but when that has past shake off the excess glue and seal the entire cork and sand base with another layer of thinned down white glue. This is apparently important. This was my first time using cork to fancy up a miniature base. It wasn’t hard at all. Remember to go slow, use solid basic techniques, measure twice, cut once, and when in doubt pin the model. These Slaneesh Daemons are not a high priority in my painting queue, in fact I have to make some custom movement trays again and do yet more basing, this time 54 Night Goblins. Oh boy! Eventually they will be primed grey as discussed previously, but first I may use a little green stuff to fill gaps in the multi-part metal model. I’ll leave the ride unmounted until most of the way through the paint job.